There was an emergency at our house today. Fairly serious too. 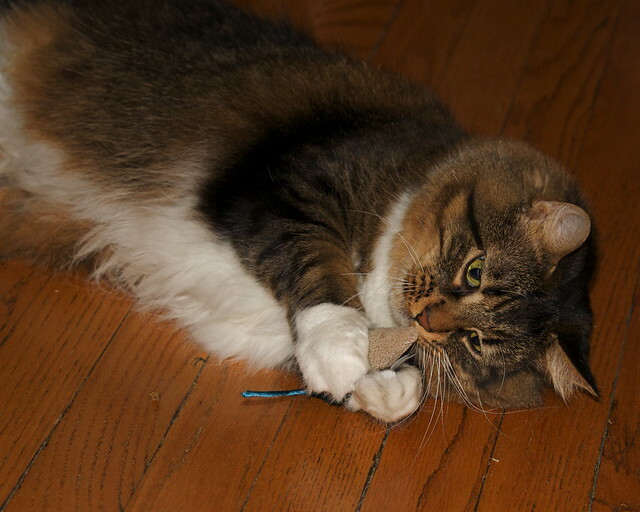 It seems the cat - new to us just a month ago - has finally calmed down enough to want to play. We had a peacock feather which she loves, but for real thrills that has to be Human Powered. Not always ideal when one is trying to work or not at home. About an hour ago the cat careened into the kitchen, pounced on her food bowl and deftly fished out one nugget which she proceeded to bat and chase around two rooms before eating it. OK, that is a cat that needs a toy. Alas, neither of our last to cats were toy lovers, so we did not have any on hand. That called for emergency action! I ran for the sewing cave and cut a hunk of tan, fuzzy material. Finding a piece of green yarn-like string, I lopped off a 3" piece. Snatching up needle and thread I dashed back downstairs to the kitchen. 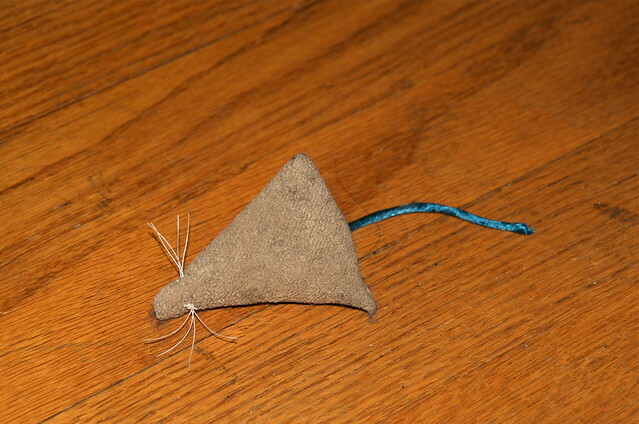 15 minutes later I had the structure of an EM-CNF 01: Emergency Mouse-CatNip Filled model 01. 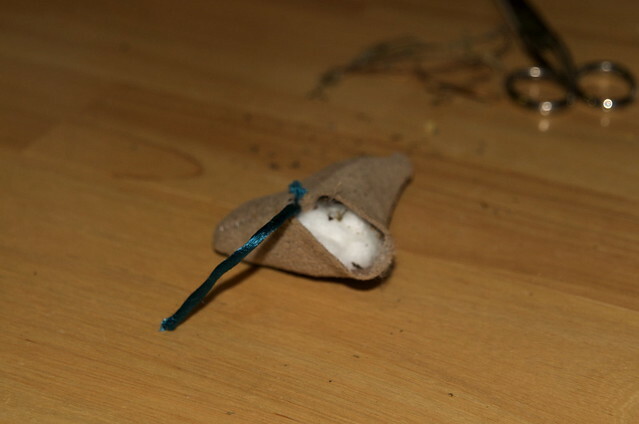 I stuffed the nose with cotton ball to help keep it's shape post ravaging. 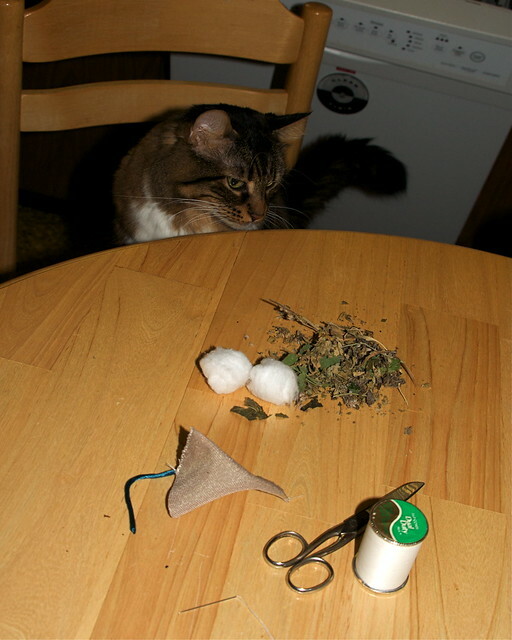 I loaded in a goodly portion of Grade A organic Catnip from the yard, interspersing it with structural cotton batting and a few stems to give it that bone-filled-mouse feel. I sewed up the final seam, added some disguising whiskers and stood back to inspect it. The intended audience was chirping and "mrrrt? "-ing with frequency which indicated at least a marginal success. The initial testing phase was a smashing success. The subject rolled, frolicked, grunted, chirped, and batted the EM-CNF 01 all around the living room, delighting when it would get wedged in a tight spot that required deft extraction. Mission accomplished! Total elapsed time from concept to integrated testing was 28 minutes. Hooah! UPDATE: Subject developed the munchies, ate, and is currently staring vacantly out the window.